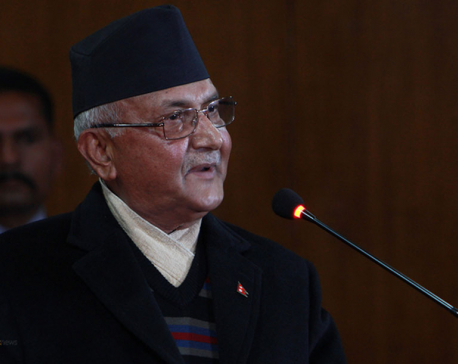 KATHMANDU, April 14: Prime Minister KP Sharma Oli on Sunday said that the government would increase the social security allowances to senior citizens through the upcoming fiscal year budget. Oli said so while inagurating a national campaign for health insurance of senior citizens and opening of bank accounts of all Nepali on the occasion of the Nepali New Year 2076 BS in Kathmandu. He said that the government has been paying attention to every sector of the social security. “Nobody should remain poor in the country because the government is working for the well-being of people from all walks of life,” Oli said. The prime minister expressed the hope that the campaign for health insurance of senior citizens will provide great relief to the medication of the senior citizens. “In the next couple of years, entire Nepal will be completely healthy. We are working towards this end,” he said. On the occasion, PM Oli distributed health insurance cards to some senior citizens. Meanwhile, Prime Minister handed over check to his father Mohan Prasad Oli and mother-in law Dhanmaya Shakya to open banking account at Rashtriya Banijya Bank. Is PM distancing himself from ministers, party leaders?